To get started with the JBC Program the full kit and access to the curriculum must be purchased. Following a successful card transaction or the submission of a purchase order, you will be prompted to set up your Junior Botball Curriculum account, which will give you access to the full curriculum via the “Resources” tab of the Junior Botball webpage. 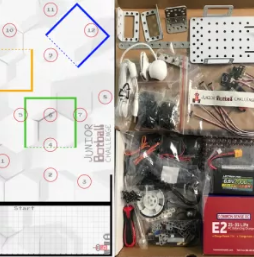 processor, motors/servos, sensors, legos, 2 JBC Mats, etc. along with 1 year access to the JBC Curriculum. *If you have already purchased a full kit and just need to re-register and purchase another year of curriculum access, please visit this page. If you have any questions, you can contact us directly at info@kipr.org or 405-579-4609 to renew your account.